Here is my newest precious family member. 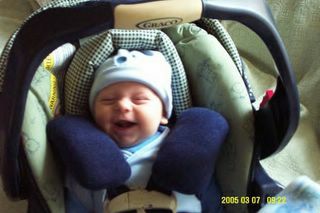 My grandson Benjamin. I've only got to meet him on a few occasions so far. He lives in another state and it is a four hour drive. Benjamin is a wonderful, wonderful person and is growing like topsy. When I first saw him he was 10 pounds of sleepy baby. He is now 15 pounds of very alert baby and at three months of age, he is as large as some one year olds. He loves being held and cuddled and he enjoys his grampa's ticklie beard. He has recently made a rare discovery of his fingers and has determined that they fit nicely into his mouth. He also makes great baby fists, a sign of a true street fighter. Benjamin, buddy, your grampa and grandma love you!